Most of the people pay more attention to the beauty and grooming of their Facial skin as it attracts the first attention of people but unfortunately neglect the skin on hands and feet. 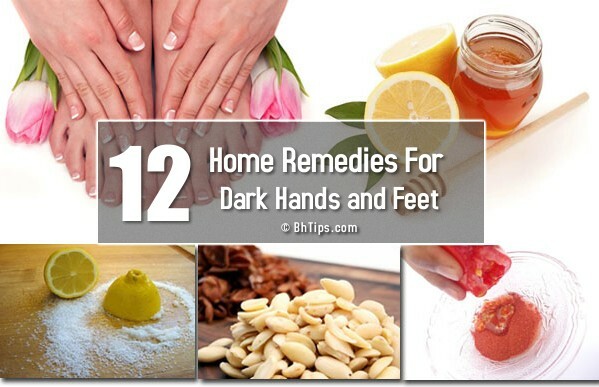 Continuous negligence and improper skin care may lead to darkening of hands and feet. One of the most simple and effective home remedy to turn dark hands and feet into fair glowing is simple massage with raw milk because raw milk is rich in lactic acid that gently exfoliate the dead skin cells from the surface of skin. In addition, Lactic acid is also considered a good natural skin bleaching agent that gradually lighten your skin tone. Skin nourishing properties of raw milk penetrate into your skin pores and deeply cleanse your skin. Skin Moisturizing properties of raw milk soften the rough skin specially at the points of finger joints and helps a lot to give you soft, smooth and fair glowing hands and feet. (i) To whiten your hands with raw milk, first of all simply wash your hands and feet then pat dry them. (ii) Now dip a cotton ball in raw milk and wipe your hands and feet with it.You will be surprise at how much dirt it will collect. (iii) Now with help of a new cotton ball, apply raw milk on your hands and feet and massage for few minutes. (iv) Let the milk absorb into your skin and then wash off after 20-30 minutes. (v) For best results, repeat this procedure on a daily basis until you get the desired results. 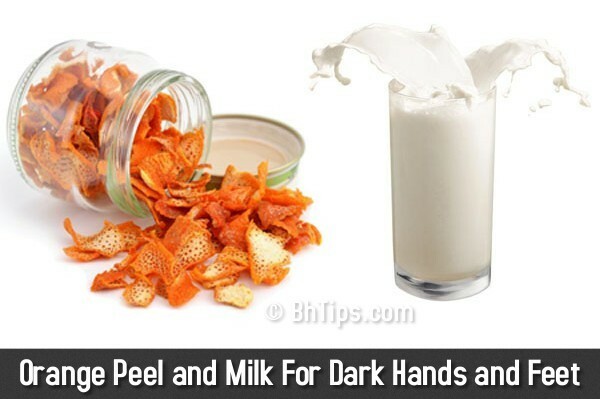 Orange peel is a good source of Vitamin C and acts as a natural bleaching agent. This property makes orange peel an ideal ingredient for skin whitening packs and masks. (i) Take some orange peels and spread the orange peels in a tray and place them in an area that receives a good amount of sunshine. (ii) Leave them for 1-2 days or until they become completely dry. (iii) Now grind the dry orange peel to make a smooth powder and store in air tight container. (iv) Now take some orange peel powder and add some milk to make a thick paste and and apply the paste on your clean hands and feet. (v) Let it stay at least for 20 minutes and then wash off. (vi) For best results repeat this at least thrice a week. 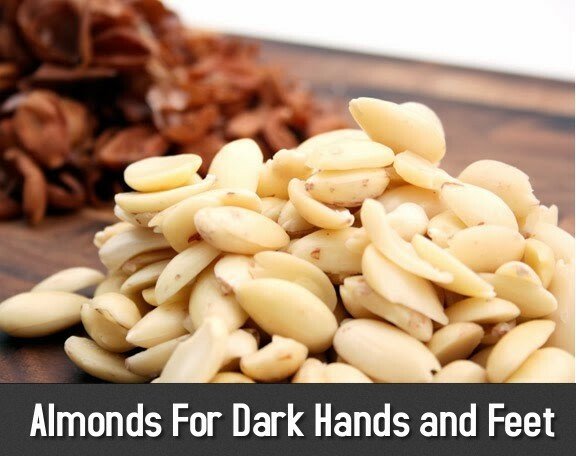 This is one of the best home remedy for dark skin on hands and feet and give you fair complexion. Sandalwood is a natural skin cooling, healing and lightening agent. 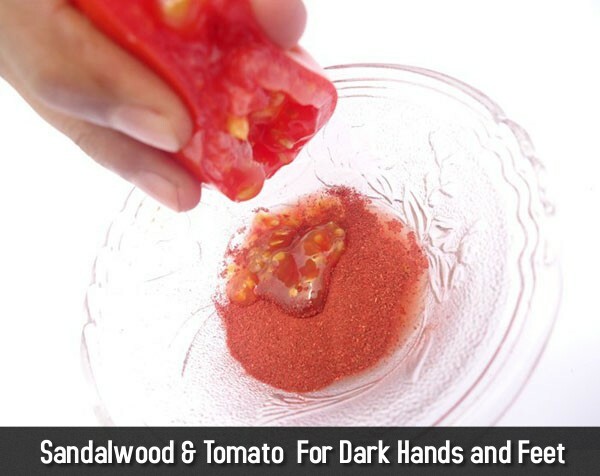 Sandalwood pack along with tomato is a great skin whitening pack that helps lot to get rid of of sun spots, brown spots and uneven skin blemishes on your hands and feet and gives you a clear and lighter complexion. (i) Take 1 tablespoon of sandalwood powder and mix with 1 teaspoon of tomato, 1 teaspoon of cucumber and 1 teaspoon of lemon juice. (ii) Mix them all to make a paste and apply this paste on the skin. (iii) After 15 minutes remove it with fresh water. (iv) Regular application of this paste will make your dark hands and feet fair. 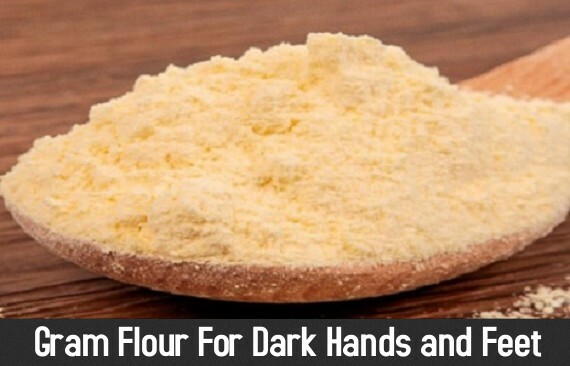 Gram flour pack is another great way to lighten the skin tone of your dark hands and feet. Gram flour is very helpful in removing the dirt, dust and impurities accumulated over the skin and helps a lot to give to an even skin tone. Alkalizing abilities of gram flour help to balance the pH level of skin. In addition to skin whitening, gram flour pack is also very helpful to treat acne, pimples and oily skin problems. However, to whiten your dark hands and feet you can make the given gram flour skin whitening mask by following given instructions. (i)Take 2 tablespoons of gram flour(besan), 1 teaspoon of turmeric powder(haldi), 2-3 tablespoons of milk and 1/2 teaspoon of lemon juice. (ii) Mix them well to make a smooth paste and apply on your hands and feet. (iii) After 15 minutes rinse off with water. If you have a dry skin then apply a good moisturizer to prevent skin dryness. (iv) Regular application of this paste will give your skin brighter, lighter and glowing complexion. Anti-oxidant , anti-inflammatory and deep skin moisturizing properties of aloe vera gel are very helpful to get fair glowing hands and feet. Follow the given instructions to get fair hands and feet. (i) Extract the gel from fresh Aloe Vera leaf. (ii) Massage the fresh gel on your hands and feet for fairer and fresher skin. (ii) Rub for 5-10 minutes and then leave for few minutes. (iv)Finally wash off with fresh water. 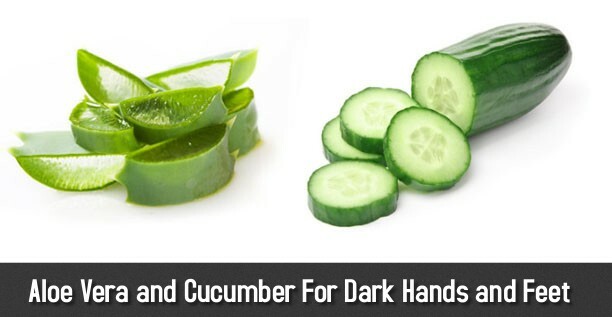 Skin soothing and lightening properties of cucumber are also very beneficial to get rid of dark hands and feet. By following the given instructions you can use the fresh cucumber slice to lightening the skin tome of your dark hands and feet. (i) Rub a fresh slice of cucumber on your dark hands and feet. (ii) Keep rubbing for 3-5 minutes and let the juice absorb in your skin. (iii) Finally wash your hands and feet after 10-15 minutes. Potato juice is a natural skin bleaching agent and also helps a lot in reducing dark pigmentation from your hand and feet and helps to lighten the complexion of dark hands and feet. To restore the fairness of your hands and feet use the Potato Slices by following given tips. (i) Rub fresh potato slice on your hands and feet or simply massage your hands and feet with fresh potato juice. (ii) Let the potato juice absorb into your skin for few minutes. (iii) Finally wash your hands and feet with fresh water. Honey is a great skin lightening as well as skin moisturizing agent. Antibacterial properties of honey are very helpful to fade away the acne scars and dark age spots. Lemon is famous for its natural skin bleaching properties. 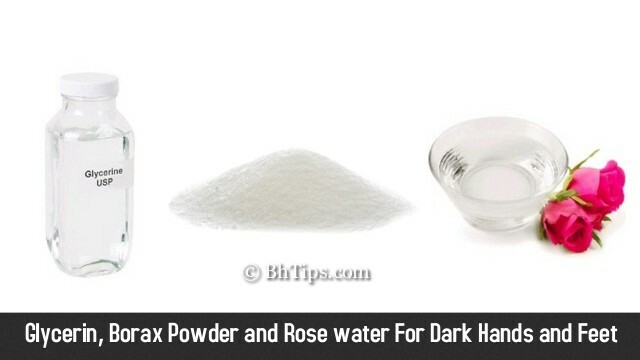 While milk powder is very beneficial to whiten your skin tone. 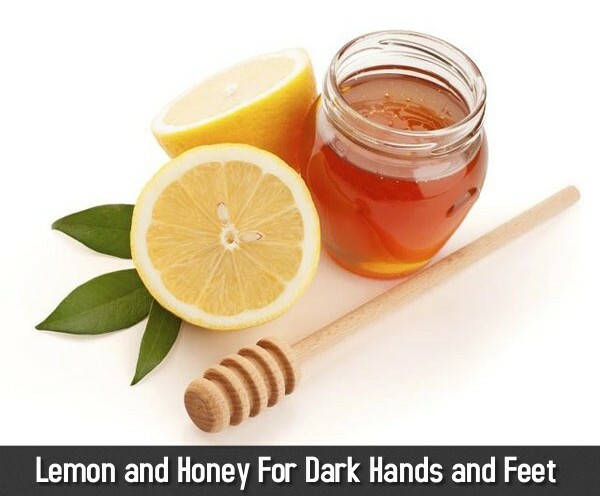 A skin whitening pack made from mixing honey, lemon juice and milk powder is also very helpful to lighten the skin tone of your dark hands and feet. To make this skin whitening mask at home you need to follow the given instructions. (i) Take one tablespoon of honey, 1 tablespoon of lemon juice and 1 tablespoon of milk powder. (ii) Mix them well and apply on your clean hands and feet. (iii) Leave this for 20 minutes and then wash off. Lemon and cucumber both contain a good amount of Vitamin C which plays an important role to get fair and glowing skin. Turmeric is a rich source of anti-oxidants that protect the skin from skin damaging free radicals. In addition, natural skin bleaching properties of turmeric along with lemon and cucumber helps a lot to get rid of dark hands and feet. You can make a skin whitening pack according to given instructions. (i) Take two tablespoons of lemon juice, two tablespoons of cucumber juice and 1/2 teaspoon of turmeric powder. (ii) Mix them well and apply this mixture on hands and feet. (iii) Leave it for 20 minutes to dry and then wash it off. (iv) Repeat this regularly and see the difference within 2 weeks. Almond is a rich source of vitamin E and many essential nutrients which are important for skin lightening. Due to amazing skin rejuvenating as well as skin lightening properties, almond is often used in various skin fairness products. You can make an almond skin whitening mask according to given instructions. (iii) Make a paste by adding one teaspoon of Gram flour(Besan), one teaspoon of milk and 4-5 drops of Lime juice. (iv) Apply this paste on your clean hands. Then massage in circular motion. (v) Leave for 15 minutes and then rinse off. (vi) A regular massage with this paste will bring Natural Fairness on your hands and feet. Deep skin cleansing properties of borax powder, skin moisturizing properties of glycerine and skin cooling and soothing properties of rose water, all work together to get rid of dark hands and feet. For Fairer hands and feet you can make a paste by following give instructions. (i) Mix three spoons of Borax powder, two spoons of glycerin, and two cups of rose water. (ii) Apply this mixture on your hands and feet and leave it for 15-20 minutes. (iii) Then wash it off with fresh water. Oatmeal acts a gentle scrub to remove dead skin cells and promotes the growth of new, healthy and fairer skin cells. For dark hands and feet due to excessive Sun tanning you can make a skin whitening pack according to given instructions. (i) Take 2 tablespoons of oatmeal, 1 tablespoon of curd and 1 tablespoon of fresh tomato juice. (ii) Mix them well and apply on the affected region to lighten the skin on the affected areas. (iii) After 15 minutes remove this mixture with fresh water. (iv) Do it regularly for 2 weeks or until required results. Exfoliate at least once per week is also essential to remove dead skin cells. You can use any natural scrub to remove dead cells. You can also prepare a natural homemade scrub with salt and lemon according to following instructions. 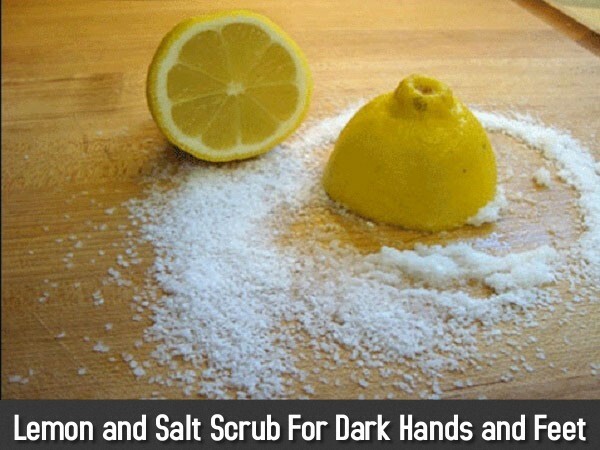 (i) Simply sprinkle some salt on either half of any freshly cut lemon and gently rub it on your hands and feet. (ii) Lemon acts as a natural bleach and salt gently remove dead skin cells. (iii) Lemon and salt scrub really helps a lot to remove dead skin cells and gives you blemish free and fair skin. (iv) After skin exfoliation don't forget to apply a good moisturizer to prevent skin dryness. (i) Whenever you plan to go out in Sun, apply a good sun screen on your all visible body parts at least half an hour before going out. (ii) Don't go out in sun while applying any skin bleaching product or natural ingredient with skin bleaching properties like lemon or turmeric etc. Otherwise instead of lighten your skin tone they will further make your skin more darker after contact with UV Sun rays. (iii) While dish washing, avoid usage of harsh chemical soaps or wear gloves to to keep your skin healthy. (iv) Don't wear too tight shoes, they may also cause darkening of feet. (v) Just like, your face and neck, deeply cleanse your hands and feet at least once a week to remove deep skin dirt, dust or pollution particles. (vi) Exfoliate your skin at least twice per month to remove dead skin cells and to promote the growth of healthy skin cells. (vii) Whenever you go for manicures and pedicures, always use properly clean and sterilized equipment because improperly or poorly sterilized equipment can cause fungal infections and may damage the skin of your hands and feet. (viii) Try to consume a healthy and well balanced diet containing all essential vitamins and minerals to keep your body & skin healthy and glowing with an even skin tone. (ix) Drink at least 8-10 glasses of water on a daily basis to remove wastes and detox your body and skin. (x) Before going to sleep, don't forget to apply a good moisturizer on your hands and feet along with your face and neck. Lack of skin moisture may also causes darkening of skin.